MLA paraphrasing is where you take a piece of literary work and repeat it back but use completely different words while preserving the original meaning. Rather than summarizing which often reduces the length of the piece considerably; rephrasing will generally keep the length of the piece around the same length as the original. MLA or Modern Language Association style refers to the particular style of academic writing that is being used and will dictate how you cite the work that you have re-phrased within your own document. Where Would You Need to Use MLA Paraphrase? When writing an academic document, especially one that will be placed online, it is vital to avoid plagiarism or copying. This means that for your work to not fall foul of any plagiarism checking either by those reviewing your work or by the search engines online you have to ensure that anything that you are “quoting” or using in some way has been rewritten into completely different words. However, you still need to give proper credit to the originators of the work that you are rewriting so the use of paraphrasing citation MLA style referencing needs to be employed. Plagiarism is bad and it is rampant worldwide. In business, in school and everyday activities, plagiarism always tries to thrive. 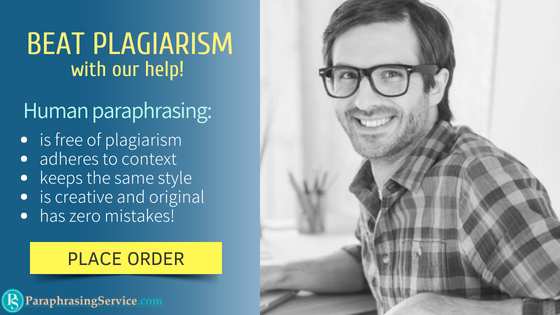 The good news is that paraphrasing, as well as good MLA citation online paraphrase example, is one good strategy to overcome plagiarism, paraphrasing presents the ideas and information you have read in your own words. By expressing content in your paper from your own statements, you demonstrate to your readers that it is your own concepts you wish to convey to them. You can use either the MLA or APA paraphrasing to your best advantage. Even if you do not quote a source directly and only paraphrase a source, you must still give direct credit to that source using an in-text citation following MLA guidelines. In MLA paraphrase, your citation is placed at the end of your paraphrase, but before the period. List the author’s last name following an open parenthetical mark. List down on the MLA paraphrasing page numbers that are being used and then end your citation using a parenthetical mark. For multiple pages, use a hyphen between the numbers and mention the name of the author you are paraphrasing or you only need to cite the page numbers you are paraphrasing in parentheses. The statement must be in your own words. In MLA paraphrasing, do not simply use a thesaurus. By flipping the sentence, you interchange the beginning with the end and move the end to the beginning creating an entirely new structure. To introduce the source, add a signal phrase before the paraphrase or a quote or a summary. A signal phrase makes readers aware that a new source is introduced and may even state some info from the source or about it. Use MLA paraphrase citation afterward to comment on what the source stated using your own voice. Even if a paraphrase is stated in your own words, it is still coming from someone else’s idea, so use a citation. MLA paraphrase citation allows you to share ideas of an author idea without using any direct quotes. A good paraphrasing citation MLA, conveys the meaning of the source used and attributes it correctly. Your citation must be before the period at the at end of your paraphrase. The last name of the author must be listed following an open parenthetical mark. List the page numbers you are paraphrasing, and then close your citation with a parenthetical mark. Use a hyphen between the number for multiple pages. If you mention the name of the author you are paraphrasing in your paraphrasing citation MLA, you only need to cite the page numbers you are paraphrasing in parentheses. So you rewrite the work and follow it with the authors name and the page number. The full reference will be within the reference section of your work allowing the reader to follow up on the cited works should they wish to do so. So MLA format requires you to rewrite what was originally said into completely new words while fully preserving the original meaning, this does not just mean taking each sentence and replacing each word with a synonym straight out of a thesaurus. It requires you to understand the work fully and repeat it often with a completely different sentence structure. MLA format is second nature to our highly experienced writers. They are graduate degree educated within the areas in which they work and can take the works that you require to have re-phrased and reproduce them within the MLA style. So if you are struggling with either how to paraphrase a website or how to produce your citations with the MLA format we can provide you with the expert MLA help that you need. Why Choose a Paraphrasing Service? When a problem arises with your paper, hire a paraphrasing service to provide you with original texts only using the information that submitted to them for paraphrasing MLA style. Find services for your paper like no other as fees suit anyone’s budget; you are sure that the job is 100% free from any plagiarized content and you get the paraphrasing MLA style and service that suit all your requirements. The job is under professional experts, who have lot of years of writing experience. Call for help as support available 24/7/. MLA paraphrase provides plagiarism-free work! Learn all the niceties of MLA paraphrase with our help!